Protect your work surface, bedding, upholstery & carpets against from burns and unsightly scorch marks. This Heat Resistant Mat from Miss Bollywood is a "must-have" product to help avoid damages from high temperatures emitted from Ceramic Styling Irons & Tongs and could save you ??s! Easily folds away; great for travelling! No more burnt carpets or bed covers! 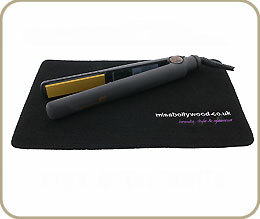 Suitable for most models of slimline hair straighteners - Babyliss, GHD, MD, Hair Tools, Hai Stik, Me2 Xtreme, PBM etc.. This is a brilliant idea and I'm really pleased with it! Means I can leave my straightners on the floor and not worry about burning the house down! Really good to protect straightners when away for the weekend and stuff! What a fantastic product, i bought this to prevent scorching anymore towels!